In 1972, psychologist Walter Mischel led a now well-known experiment (the Stanford Marshmallow experiment) studying delayed gratification. Children aged three and a half years to five and a half years were each offered a marshmallow (or another sweet treat), to be eaten immediately — or two marshmallows, to be given after they had waited 15 minutes when the tester returned. The experimental researchers noted that a minority of the children ate the marshmallow right after the testers left, some children tried to wait to eat the treat but were unsuccessful, and some children were successful in waiting until the testers returned and were given a second marshmallow. The researchers analyzed how long each child was able to wait and then, years later, were able to correlate greater later success with longer delayed gratification. Success was measured in descriptions by the children’s parents as to competency and higher SAT scores. Dr. Mischel and his team concluded that greater self control led to more success in life. Their conclusions continue to be examined in further studies, as to other variables that may correlate with delayed gratification and success. While the cognitive processes of delayed gratification will continue to be studied (which I hope to examine further here), society holds positively the skill of delaying gratification, also referred to as self-control or impulse control. Indeed, it is easy to rationally see that greater rewards often come from controlling our impulses and taking the long view — whether riding out a year or two of low monetary return for a higher return on investment, giving up the taste of chocolate cake for a fitter body, holding our tongue during a heated moment to discuss the conflict more reasonably at a later time, working with minimal reward for years in order to become an expert in a field, or skipping the third cocktail in order to have a clearer head the next day. Passing up short-term gains for long-term rewards can serve us well. We appreciate the rewards more, can responsibly manage our finances and health, and forgo the frustration of never receiving what we truly want in life — whether a fulfilling job, a happy marriage, internal peace, or a myriad other worthy goals. Fortunately, impulse control and the ability to delay gratification for longer periods of time can be cultivated and practiced. The more we practice, the better we get and the more rewards will come. Try starting with just one impulse you’d like to control better and practice this week using some or all of the following techniques. 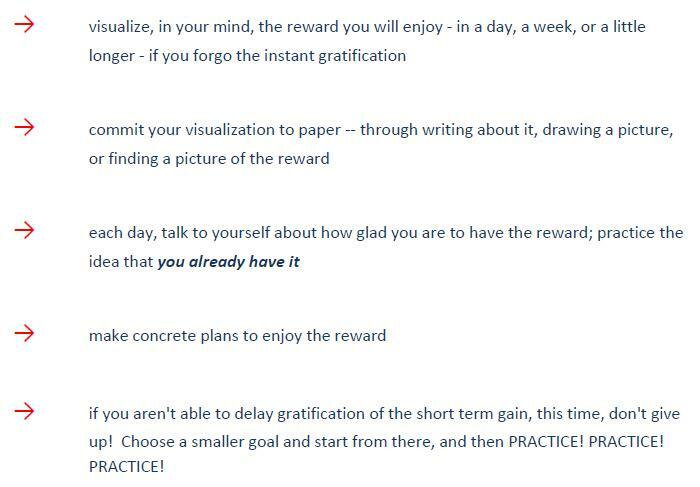 Choose something for which some longer-term reward can be seen within a week or few weeks; let’s practice on the “easy” stuff first! Here are some additional great ideas to help with impulse control from the folks at Many Years Young. This entry was posted in delayed gratification, goals, persistence and tagged delayed gratification, goals, impulse control, long view, persistence, rewards, self control. What a great reminder. Love this blog! Thanks for your support, SP!